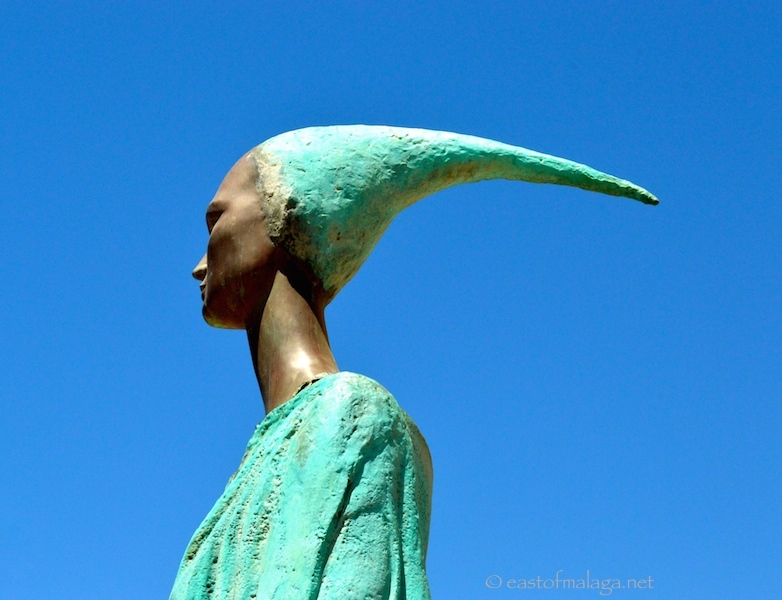 ← Malaga: the city that gives you Moore – Henry Moore! 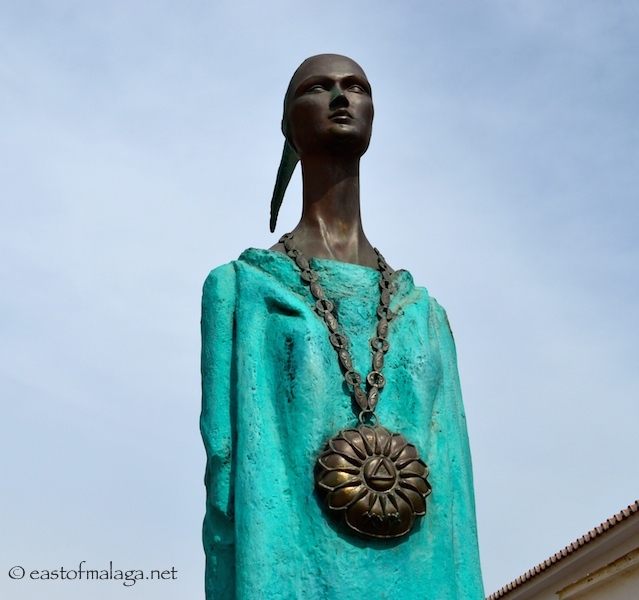 Have you met Malaga’s sensational Phoenician Goddess? Allow me to introduce you ….. This is Malac, also known as Noctiluca, Goddess of the Moon, the night and of fertility. This beautiful lady cuts a lonely figure as she stands on the promenade in Rincón de la Victoria, gazing longingly at the sea. Her people, the Phoenicians, who were experienced sailors, navigators and traders, founded the settlement of Malaka (which later developed into the city of Málaga) at the mouth of the Guadalhorce River, around 770BC. Yes, Málaga’s history can be traced back more than 2,800 years, making it one of the oldest cities in the world. Málaga’s early inhabitants were mainly engaged in fishing. They revered their great Goddess, Noctiluca, and worshipped her with offerings and sacrifices at her sanctuary in the present day Cueva del Tesoro (one of only three such marine caves in the world), in Rincón de la Victoria. Each year, an image of the deity would be carried in procession and immersed into the sea to provide good fishing for the fishermen. The Phoenician influence was considerable and many traditions and customs have been bequeathed and continue thousands of years later. 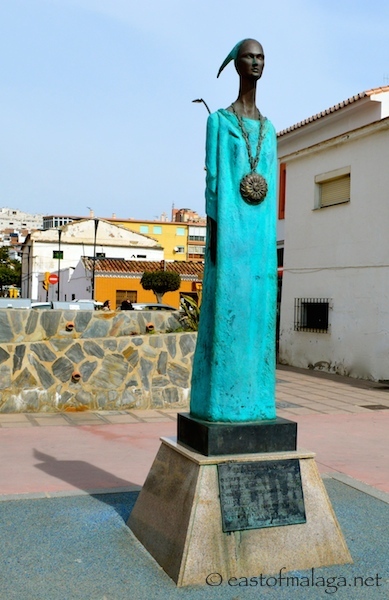 To this day, on 16th July each year, sailors and fishermen from villages along the Spanish coast, parade their statues of the Virgen del Carmen though the streets and introduce her to the sea to bless the waters. 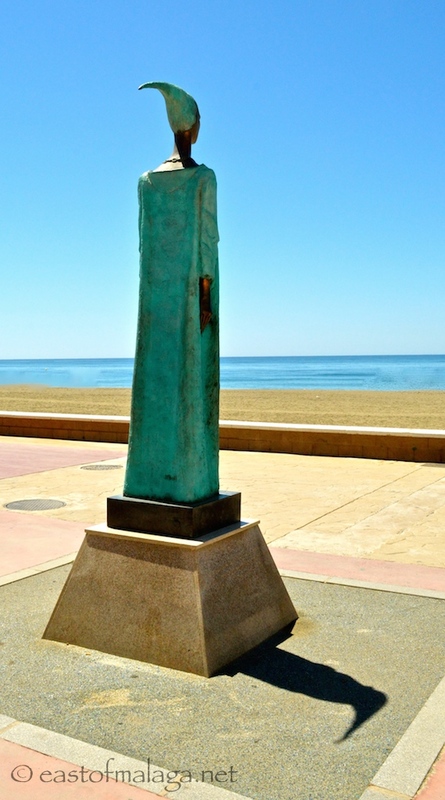 The statue of the Phoenician goddess, Malac (Noctiluca) is by well-known Málaga sculptor, Jaime Pimentel. The divinities may change, but the customs continue. This entry was tagged Andalucía, culture, East of Malaga, Europe, fiestas, Malaga, photography, Religion, Spain, travel. Bookmark the permalink. Sorry me again I use my photo of Noctiluna as my iPad wallpaper,but I prefer your photograph,please may I use yours? I haven’t seen that statue (or if I have I didn’t pay much attention haha). I personally prefer the Cueva del Tesoro, maybe because no one ever goes there (usually!) so the atmosphere in the group is usually very intimate. I found the Caves of Nerja crowded and noisy with lots of visitors jostling each other. Also in the Cueva del Tesoro you could put your hands in the basins and touch the water. We also love looking at the underground lakes in the Cueva del Tesoro. I went to the Cueva del Tesoro a couple of weeks ago for the first time. Been meaning to go for years. Unfortunately for us, our group consisted mainly of a coach load of very noisy Spanish students, so it was difficult to hear the guide even when she was speaking in Spanish. Sadly for the English speakers not only was the translation kept VERY brief but the noise level increased even more! I felt sorry for an English family who really had no idea what the guide was saying. Lovely people the Spanish but “OMG” they can be, and are, so loud at times !!! She is so beautiful, exquisite! Thanks Fatima – yes, she’s so lovely! 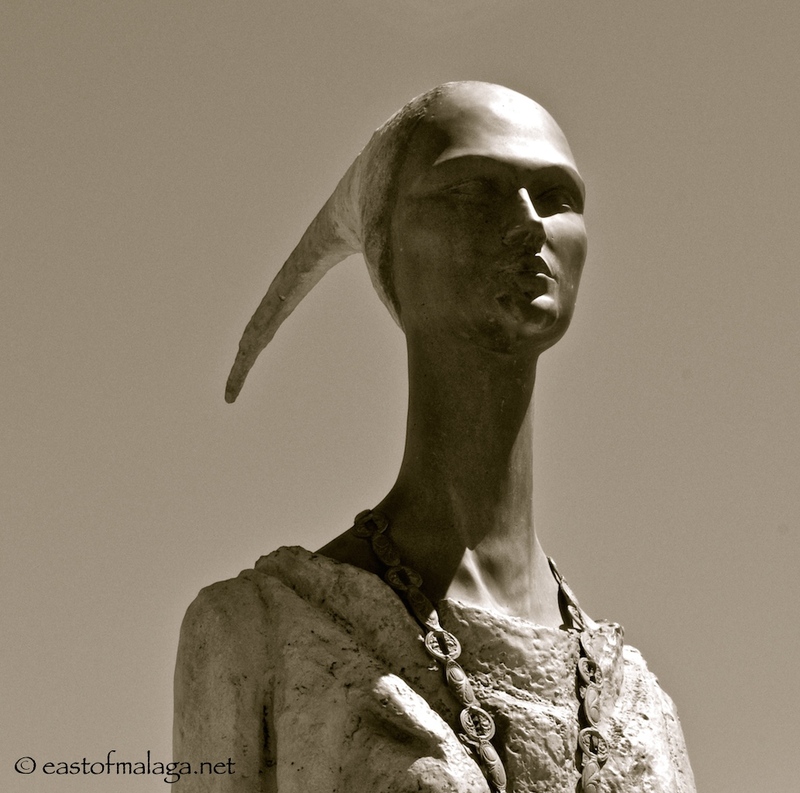 Beautiful sculpture Marianne and great info, who would have thought Malaca was that ancient ! the cave sounds very interesting. Cadiz, on the Atlantic coast is a little older, but YES, Malaga is up there on the ancient list! Yes, I love the colour too, Sue. Somehow I felt sorry for her though, the way she is gazing out to sea – almost waiting for her people to come and take her home …..
Beautiful even the combination of the metal with the blue-green that recalls of the sea islands of the South ..